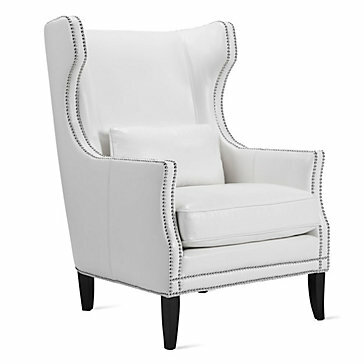 Z Gallerie has designed our exclusive Davis chair to reinterpret the classic wing chair with contemporary styling. Generous dimensions, a rounded back and removable lumbar pillow ensure comfort, with the addition of chic and shiny polished nickel nailhead trim adding the flair. Traditional side wings are updated with a rounded cutout profile, and the modern look is complemented with simple, solid wood legs with an Espresso finish. Top grain leather, quality materials, and heirloom construction establish the quality, comfort, and durability of our Davis chair. Available exclusively at Z Gallerie. Measures 32" wide by 30" deep by 45" high, with a 19” seat height and 8” wide side wings. 100% top grain, full aniline dyed leather. Removable 24” square seat cushion and 20” wide by 11” high by 4” deep lumbar pillow with breathable lower air vents. Leather welt trim on the pillows. Double row 0.25” nickel nail head trim. Solid American hardwood frame, corners blocked and glued for strength. Seat cushions are composed of high density foam core inserted in to a casing. 50% polyester, 45% feather, 5% down. Casings are constructed to prevent feather migration. Comfortable 2˝ wide arm width. Solid wood legs, espresso finish 7˝H. Includes plastic foot glides prevent damage to floors. Removable seat cushion 24˝ w x 24˝ d, finished with matching leather welt. Seat height 19˝ from floor, seat depth 24˝. Cleaning code [x]. 100% top grain, full aniline dyed leather. Professional leather upholstery cleaning recommended. Blot spills with clean cloth immediately. Dust and vacuum regularly. Avoid furniture polishes and abrasive cleaning agents. As with all fine furniture, keep out of direct sunlight and protect surfaces from heat and moisture. [value] => ahhh. . . . the beauty! [value] => Perfect height for our music room. Gorgeous accent chair, comfortable, luxurious. Watch for nailhead placement. . . only reason for 4 stars on quality. [value] => I saw this chair in the store and instantly fell in love. Sit down and melt into luxury! [value] => Love this chair! [value] => We love this furniture piece so much, we wish we had room for two! [value] => I ordered these chairs for the way they looked knowing they likely were not going to be comfortable. They are amazingly comfortable and gorgeous. ahhh. . . . the beauty! Perfect height for our music room. Gorgeous accent chair, comfortable, luxurious. Watch for nailhead placement. . . only reason for 4 stars on quality. I saw this chair in the store and instantly fell in love. Sit down and melt into luxury! We love this furniture piece so much, we wish we had room for two! I ordered these chairs for the way they looked knowing they likely were not going to be comfortable. They are amazingly comfortable and gorgeous. Show Less I ordered these chairs for the way they looked knowing they likely were not going to be comfortable.